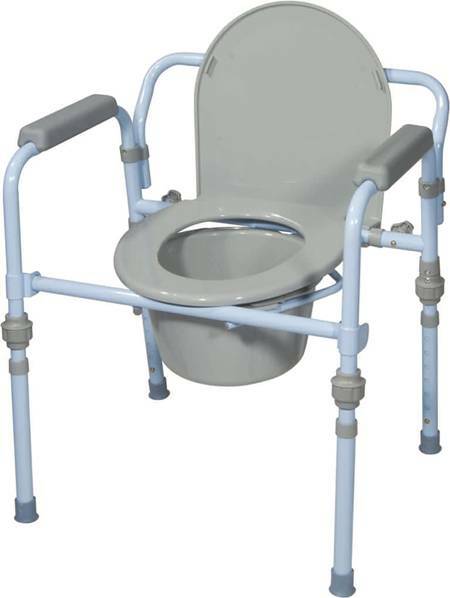 The FoldEasy Toilet Frame has several major advantages over other toilet frames on the market! The FoldEasy foot plates which rest flat on the floor in front of the toilet provide total stability. When sitting down or rising from your toilet, your weight will anchor the FoldEasy in place for solid sturdiness and stability. No Installation required, no need to modify your bathroom, - no drilling required to put in grab bars. The FoldEasy Toilet Frame does not need to be permanently afixed to the floor. The Fold Easy Toilet Frame is portable - folds easily for travel. When not in use, the Fold Easy Toilet Frame can be folded compactly and put away in a closet. 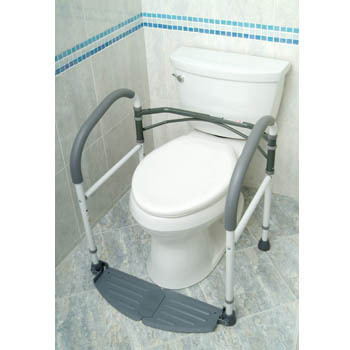 The FoldEasy Toilet Frame provides safe support for people who need help getting on and off the toilet. 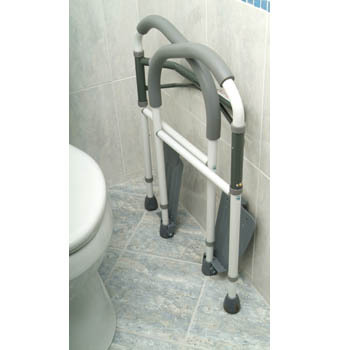 There is no need to modify your bathroom for this fully folding and adjustable portable toilet frame. This toilet frame provides huge cost savings over traditional toilet frames that need to be fixed to the floor. The folding foot plates sit flush to the floor so that the weight of the user standing on them holds the frame firmly in place. The arm rests are designed to aid the user to sit and stand with greater ease and comfort. The free standing frame of the FoldEasy fits around your toilet seat with the back bar in front of the toilet tank and behind the toilet lid. There will be no contact between the frame back bar and you, just the normal toilet lid. The FoldEasy has a height adjusting mechanism which makes it suitable for all types of toilets and environments. It also folds in on itself easily and in seconds to make it fully portable. - Weight capacity: 280 lbs.